An older vehicle, built in 1929 at Doncaster. This was a restaurant first, with a large kitchen car meal service on long distance trains. It remained in service, renumbered 651 and then 9019, until 1960 when withdrawl beckoned. 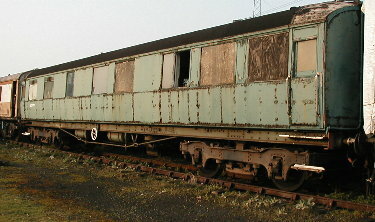 However LNER vehicles were apopular choice for conversion to staff accomodation and 1222 became a dormitory car renumbered DE320907. So it went on for another 30 years until finally ending its days at Stratford as a staff vehicle for track machine 76203. Disposed of in 1991 it was purchased by a RVP member, initially going to the Nene Valley railway for storage, moving to the GCR two years later. It presently remains in store, while the owner collects parts for a full rebuild to original condition.